Venue: A J C Bose Auditorium, Presidency University, Kolkata. "The registration process is closed now"
Plants play immeasurable roles in the survival of living organisms in myriad of environmental conditions. They are the foundation of human survival and development. The growth, differentiation, development and reproduction of plants and their interactions with the environment are most mysterious and fascinating phenomena of the nature. 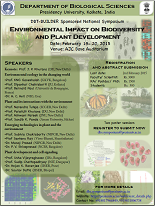 This National Symposium on "Environmental Impact on Biodiversity and Plant Development" will focus on plants-environment interactions such as plant protection, plant diversity, plants-soil interactions and so on and provide a platform for the attendees to exchange their research results. A number of eminent scientists from all over India are joining the symposium, which will be held on 19th-20th, February 2015. This two-day symposium will feature keynote talks in plenary sessions and poster presentations. DBS earnestly looks forward to the participation of scientists, scholars and students from all over India.